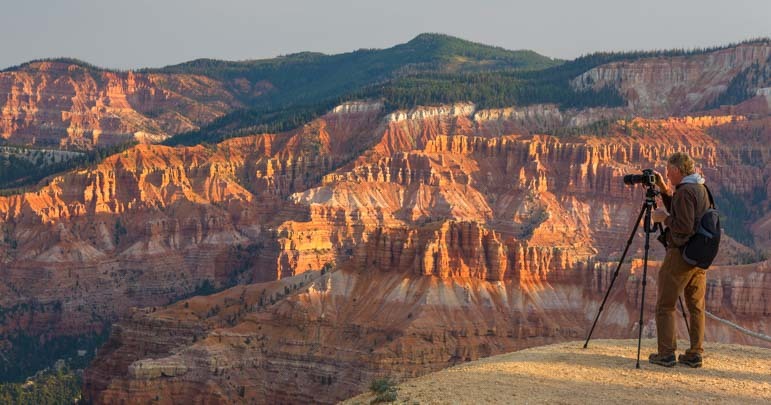 Cedar Breaks National Monument – WOW! 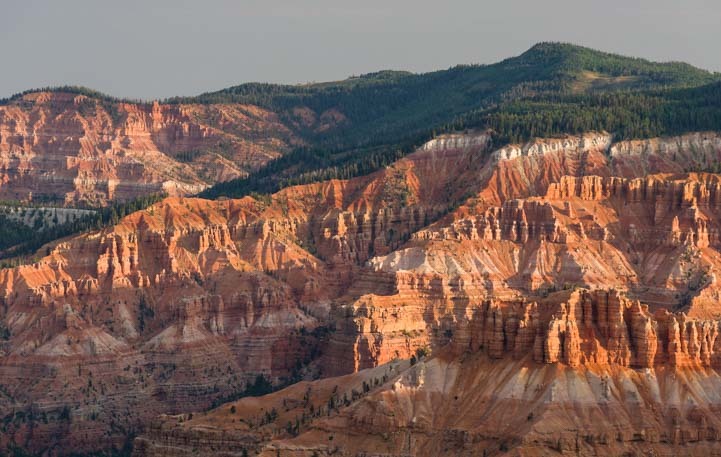 Cedar Breaks National Monument lies just above Cedar City, Utah, at a lofty elevation of 10,000 feet, ideal when the summer temps in the surrounding desert get unbearable. Prior to visiting Cedar Breaks, we had an incredibly heartwarming experience while in Cedar City. Some of our readers might have missed this post, thinking it was just another bird story about the release of a golden eagle back into the wild. However, if you have ever been a First Responder — working in law enforcement, search and rescue, fire fighting, EMT services or other professions that send you headlong into danger to help others get out of danger — this story will have special meaning for you. For those that have lost a loved one in the line of duty, this post will touch your heart. 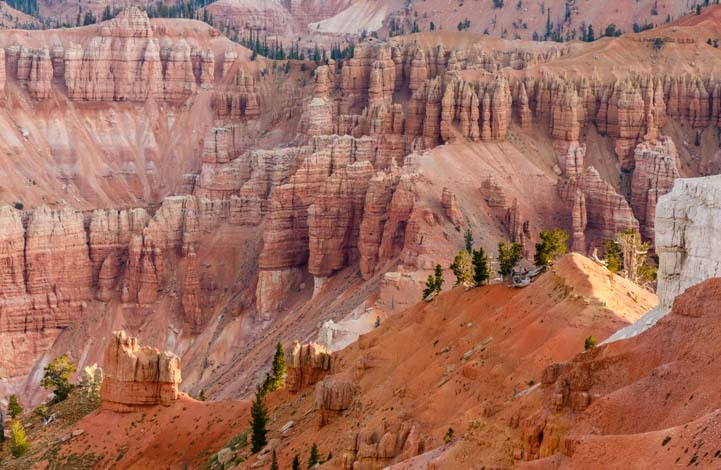 Soaring high above Cedar City, Cedar Breaks National Monument is a mammoth crater filled with pink and orange sandstone spires that jut up from the canyon floor like turrets in a fairytale castle. We snuck onto the trail before dawn to catch the soft colors in the sky above the canyon. Suddenly the sun peeked over the horizon. 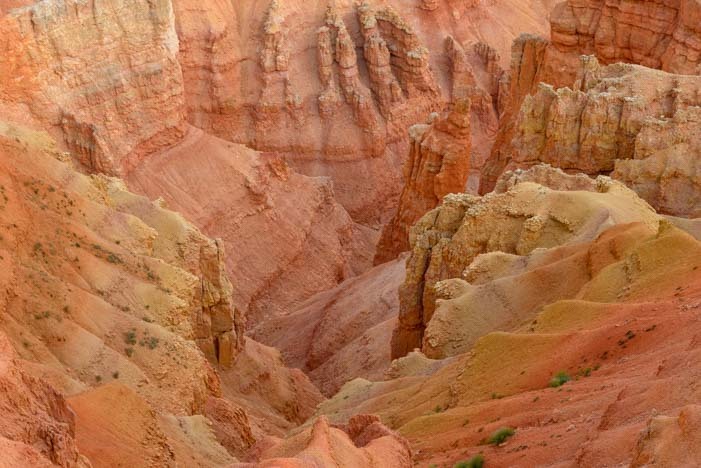 All the exotic sandstone shapes in the canyon came to life in vivid color. 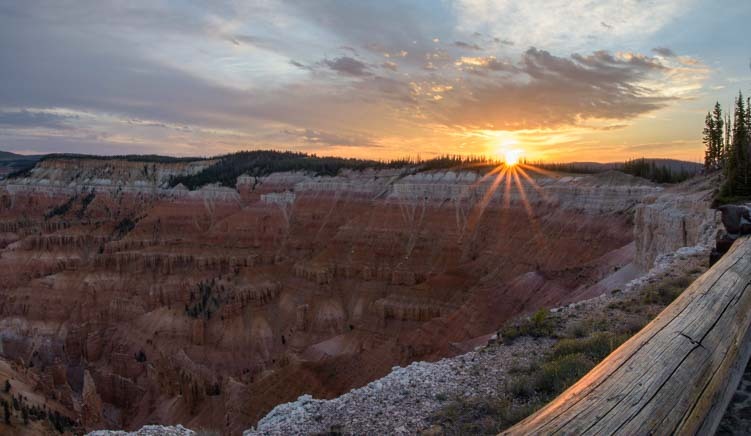 The neat thing about hiking as the sun is rising at Cedar Breaks National Monument is that no one else is out there. 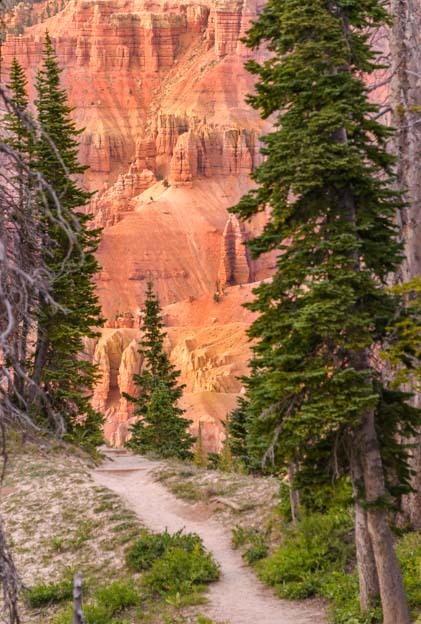 Cedar Breaks is a quiet park to begin with, but at dawn the silence in this majestic canyon was broken only by the occasional bird chirping in the trees or the rustling of some small critter in the underbrush along the trail. Patterns of light and shadow dance across the canyon. 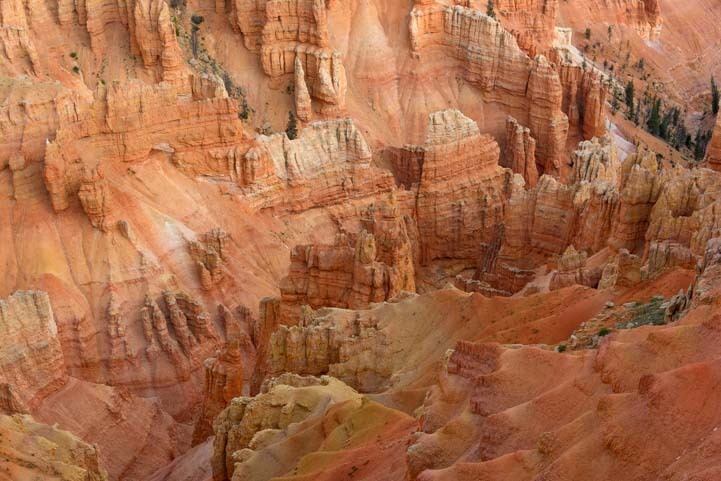 There are quite a few overlooks that offer slightly differing views looking down into Cedar Breaks from above or across the canyon to the colorful walls on the far side. It is impossible to comprehend the size and scale of this canyon unless you are standing on the rim trying to take it all in. Looking down from above, the red rock turrets at the bottom seem miniscule, yet the the tall pine trees offer a hint of their size. The tall pines were dwarfed by the fairy tale spires. 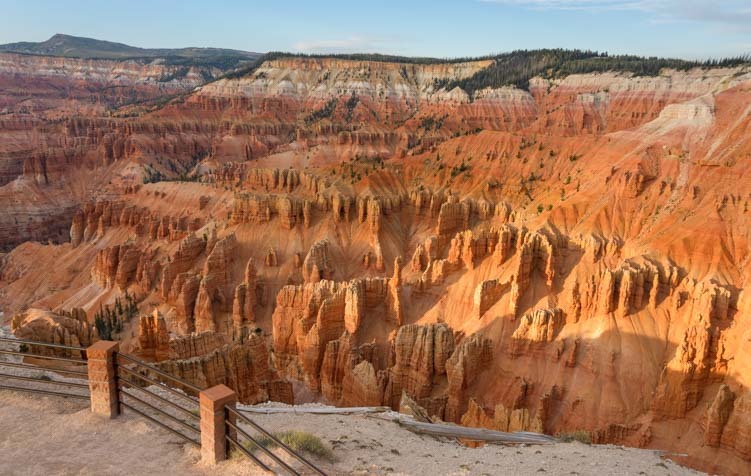 There are no hiking trails that go down into the Cedar Breaks National Monument amphitheater of rocks. This is a canyon that is enjoyed entirely from the rim up on top. We could peer down from the rim, but there are no trails to the bottom of Cedar Breaks. Even though people can’t crawl around in the depths of this beautiful canyon, the local marmot population wanders freely all over the place. These little guys are quite fearless, and I was amazed at how close they let us come. A marmot pauses in the middle of his busy morning. Cell phone and internet access is very sparse in this area, but I discovered that one place you can get a reasonable signal is at the overlook by the visitors center. One morning, I perched my laptop on the railing at this overlook, and started writing emails that were many days past due while I savored the view between sentences. 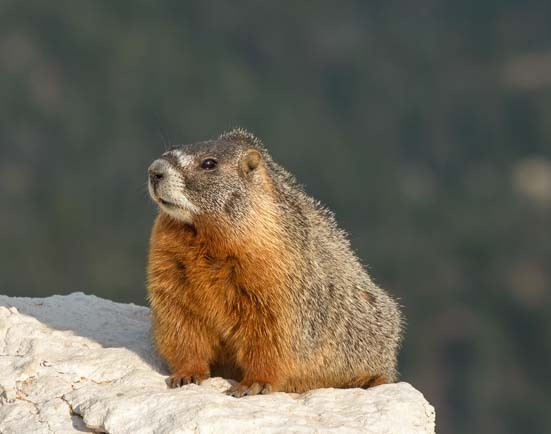 Suddenly, I noticed a marmot was sitting on a ledge right in front of me. Darn if “being in touch with the world” on the internet wasn’t getting in the way of snagging a great photo at one of America’s most beautiful National Monuments!! What was I thinking doing email silliness instead of taking pics? 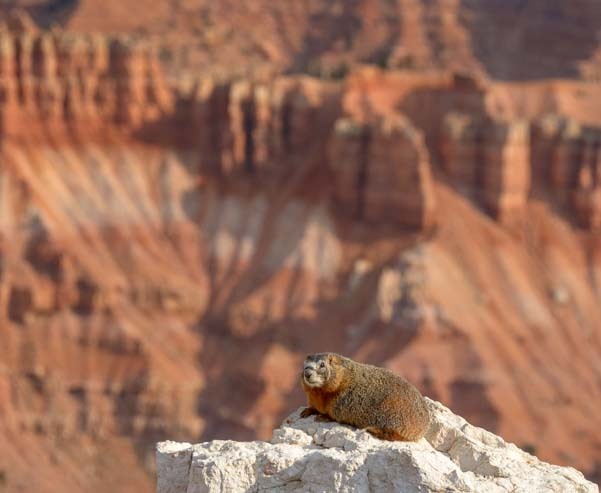 Mark wandered by and snickered while he got a great photo of the little guy with the canyon in the background. 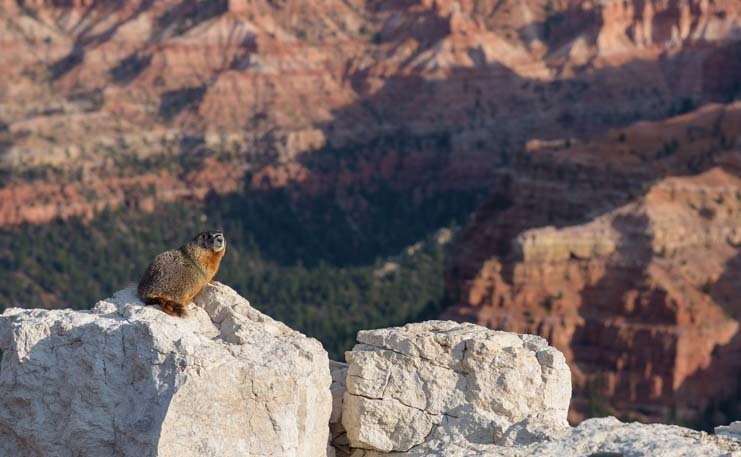 A marmot’s eye view of Cedar Breaks! But my camera was way down in the parking lot in our truck! Oh well. 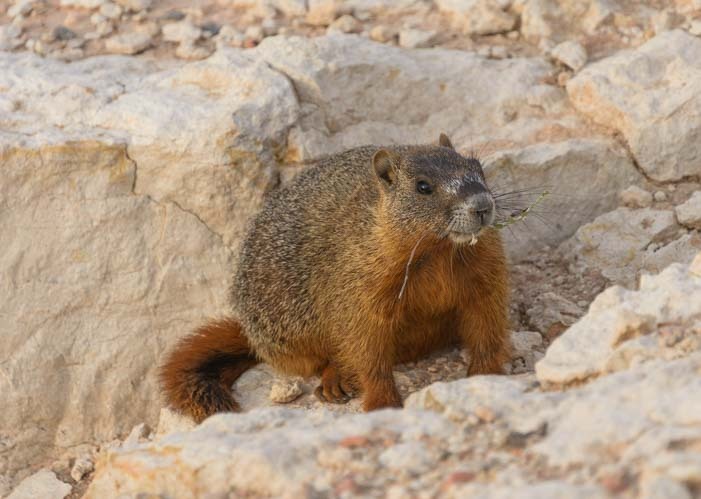 I just watched the marmot as he went about his business with grass in his mouth and I went about mine on my laptop. Fifteen minutes later, when I finally put away the darn computer, I was amazed that the little guy was still sitting there right in front of me, doing his thing with the grass in his mouth. So, I ran back to the truck, got my camera and came back to the overlook to get some photos of him myself. Not only was he still there, he was kind enough to pose for a few shots. This marmot did his thing while I did mine until I finally went and got my camera! 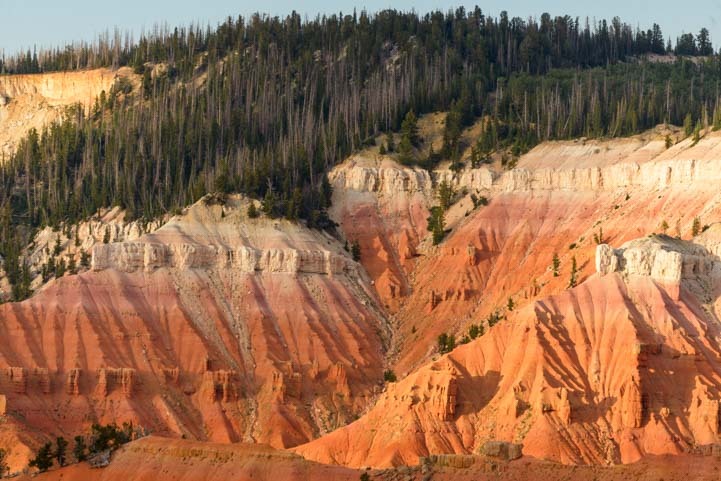 Cedar Breaks National Monument is home to one of my all time favorite hikes, the Spectra Point Trail. This trail follows the rim of the canyon from the parking lot right out onto a huge peninsula that juts out into the middle of the red rock amphitheater. It starts with a fabulous passage through tall pine trees that heads towards the rim. The heavenly scent of pine needles nearly knocked me off my feet! Spectra Point trail heads through pine trees to the canyon rim. 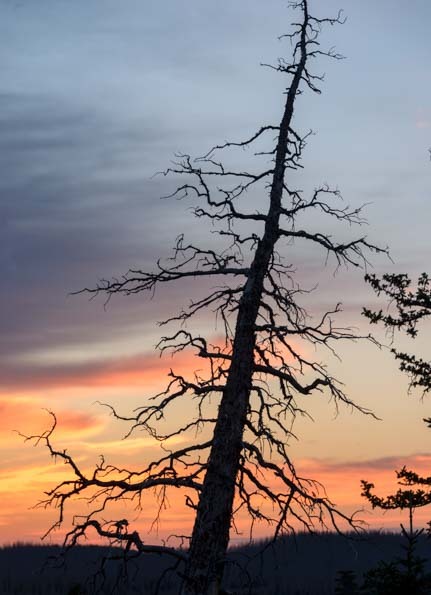 We did this hike at dawn one morning, and as we looked back towards the parking lot, a dead tree was silhouetted against the colorful sky. The bright colors of sunrise played behind an old dead tree. This is an easy hike that has stunning canyon views the whole way. However, even though the path is wide and smooth, it goes uphill and downhill a lot, and being at 10,000 feet elevation, not only are the views breathtaking but you end up out of breath too! The views on the Spectra Point Trail were stunning. 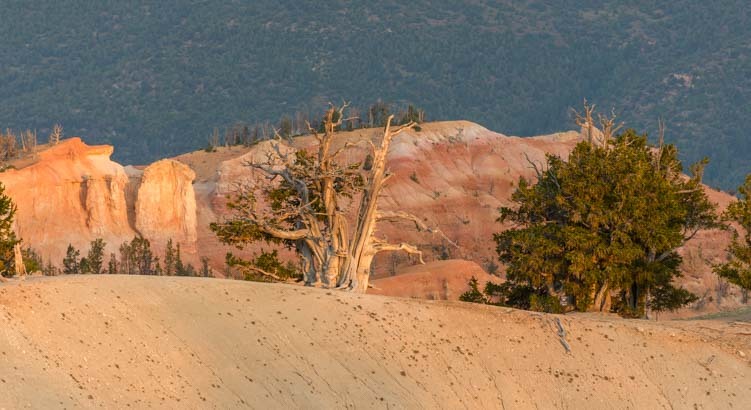 One of the special treats at Cedar Breaks National Monument is the neighborhood of Bristlecone pines that lives near the end of the peninsula at Spectra Point. Many of these unique trees are 1,000 years old or more, and one beautiful biggie has celebrated its 1,600th bithday. We could see him standing half naked at his sentry point out near the end. A 1600 year old Bristlecone pine tree stands sentinel at the end of the trail. As we walked out onto Spectra Point, the Bristlecone pines crowded in around us. These trees are the very definition of “gnarly,” with claw-like roots that snake across the ground without bothering to tunnel underneath. Bristlecone pine trees are gnarly and tenacious, hanging onto the rim of the canyon in brutal weather. Life is tough here where they like to live, with high altitudes and strong winds, nasty cold winters and all too brief summers. I think these trees must slumber through life with just one eye open. Whole branches and trunks of these trees are totally devoid of any signs of life. Yet there are a few branches on every tree that are covered in the softest bristles. For such craggy trees that are entirely bald and bent like little old grandpas, their short pine needles are as soft and as full of life as can be. The 1,600 year old great-grandaddy Bristlecone of them all gave me pause for thought as I walked around and around it to try and fit its expansive branches into my camera’s viewfinder. 1,600 years is a very long time! 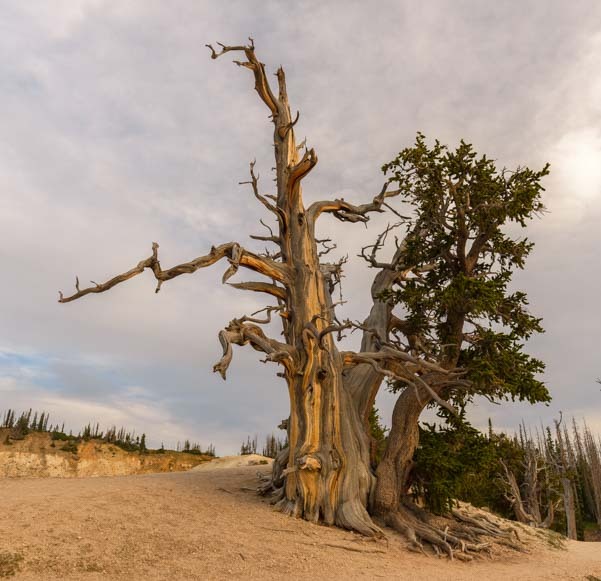 A 1,600 year old Bristlecone pine tree – a true antique! There are lots of tree species that live a long life. In Arizona, the “ancient” saguaro cactus that preside over the Sonoran Desert with a regal (and whimsical) air don’t even bother to grow their first branches until they are 75 years old. And the grand multi-branched 150 year old beauties that dot the scorching desert were mere babes when Americans were first settling the Arizona Territory. But this Bristlecone Pine in front of me predated those juvenile saguaro cacti by centuries PLUS a millenium. It even predated the “ancient” Native Americans who roamed this area! 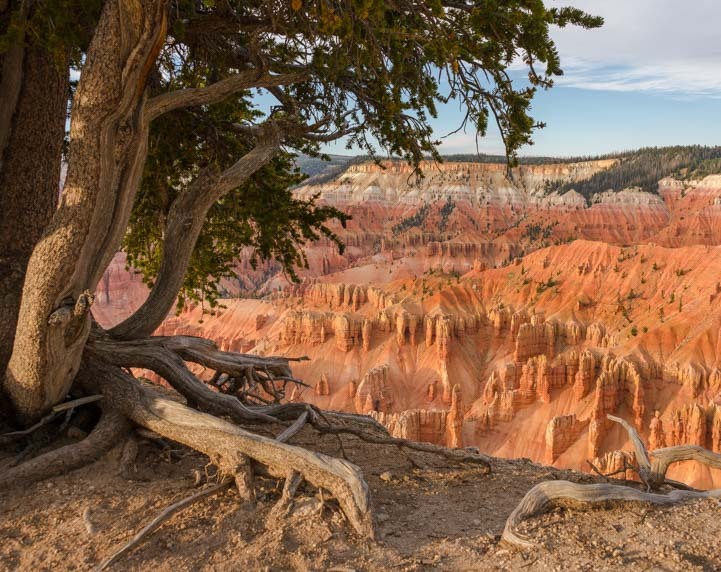 The prehistoric Anasazi people of the southwest who left their artwork behind on canyon walls didn’t make their mark until this Bristlecone pine already had a few hundred years under its belt. This tree put its roots down right around the time that the Goths sacked Rome! And it has looked out on this fabulous view at the end of Spectra Point the whole time. Spectra Point overlook at the end of the trail. 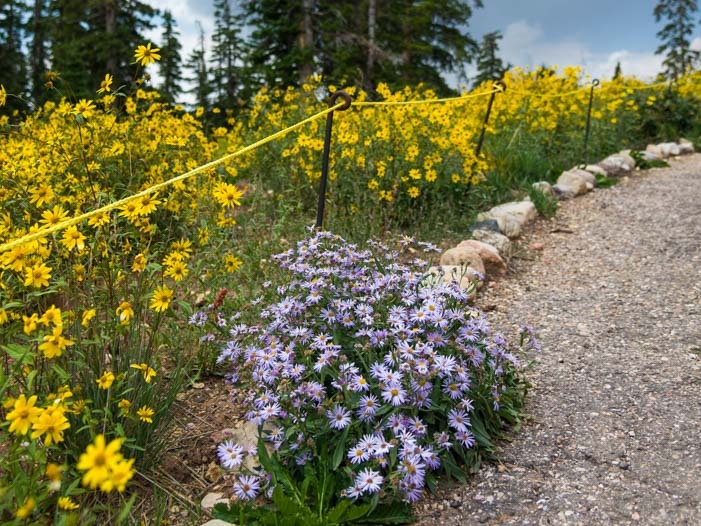 Besides red rock beauty and ancient trees, Cedar Breaks National Monument is also known for it’s incredible wildflower displays in mid to late July. 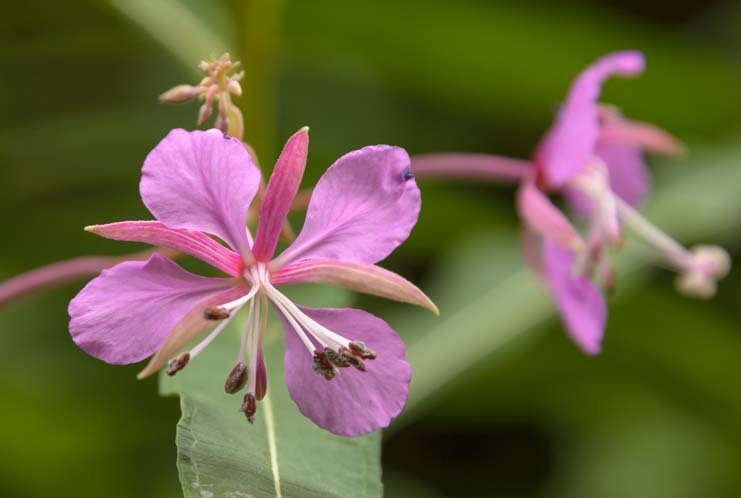 The monument even celebrates with a special wildflower festival. 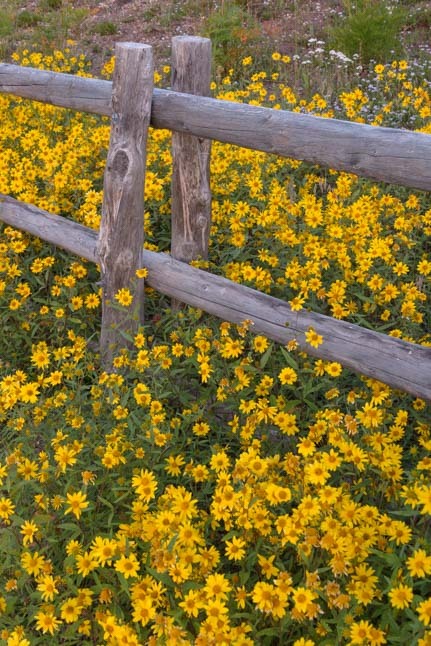 We got there a little late for seeing the blankets of wild color in the meadows, but brilliant yellow Snowy Goldeneye were blooming thickly everywhere, right up to the fencing by the visitors center. Snowy goldeneye swarm a fence post. There were a few other pretty wildflowers here and there. 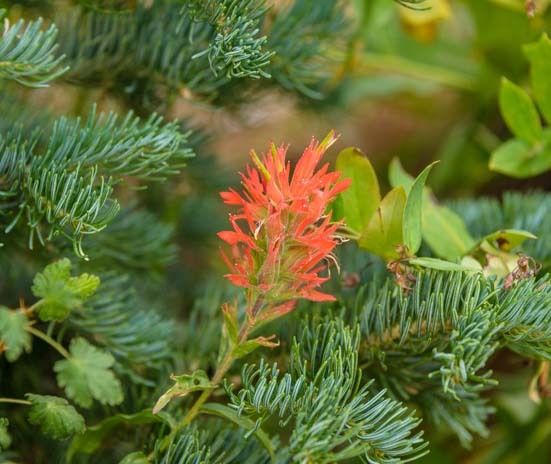 We just loved finding a bright red Indian Paintbrush tucked in between some low lying pine boughs. Indian paintbrush — surrounded by pine needles! 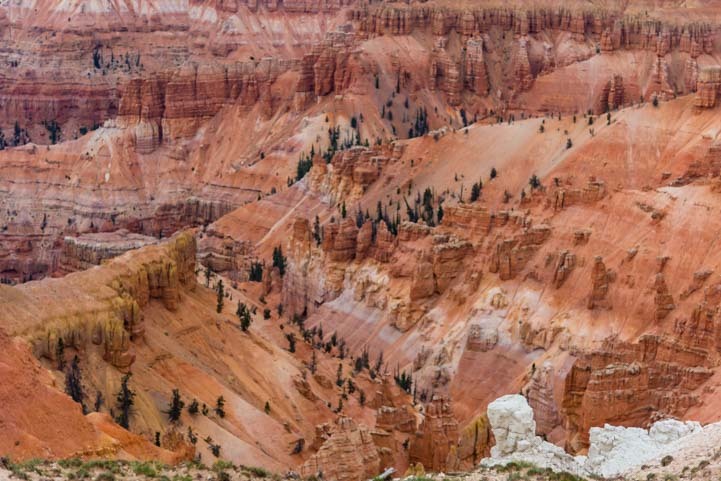 The weather in late August at Cedar Breaks National Monument can be very unpredictable. While many folks in other parts of the country were enduring an intense heat wave, we got hit with lots of afternoon thunderstorms that made the nights downright chilly. August is thunderstorm season at Cedar Breaks. One day we even got a wild hail storm that left a sheet of icy pellets on the road!! 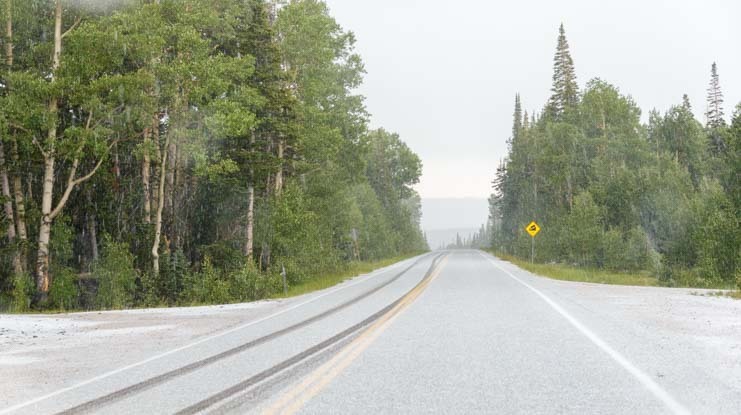 A surprise hailstorm left a layer of ice on the road… yikes! 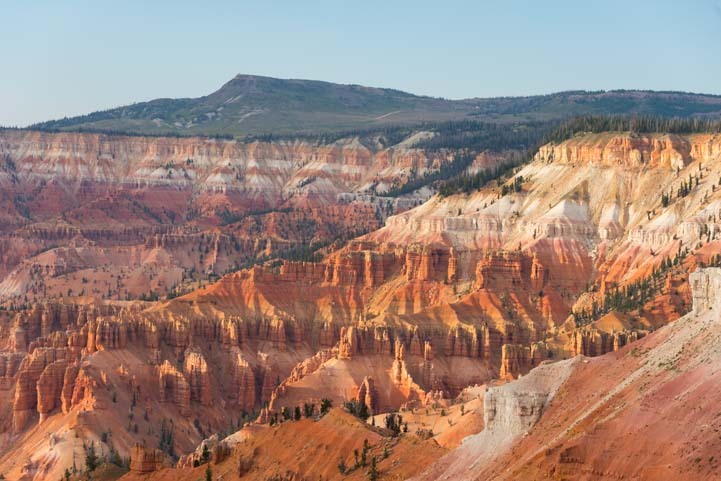 Cedar Breaks National Monument is a little gem in Utah that gets overshadowed by the more famous National Parks nearby. 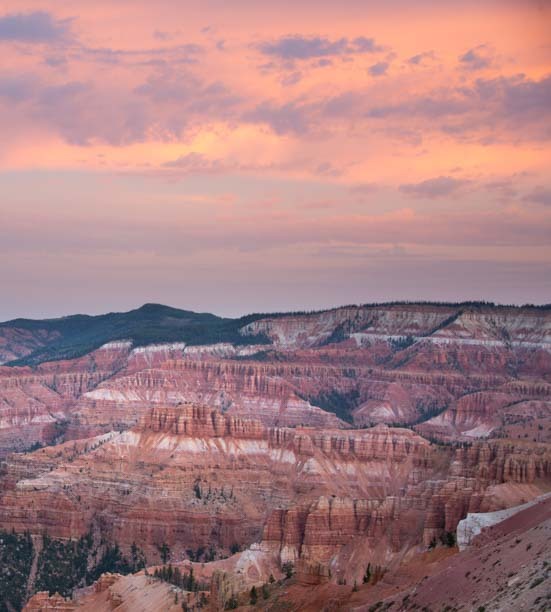 But if you take your RV to southwestern Utah, a detour to Cedar Breaks is an absolute must!! 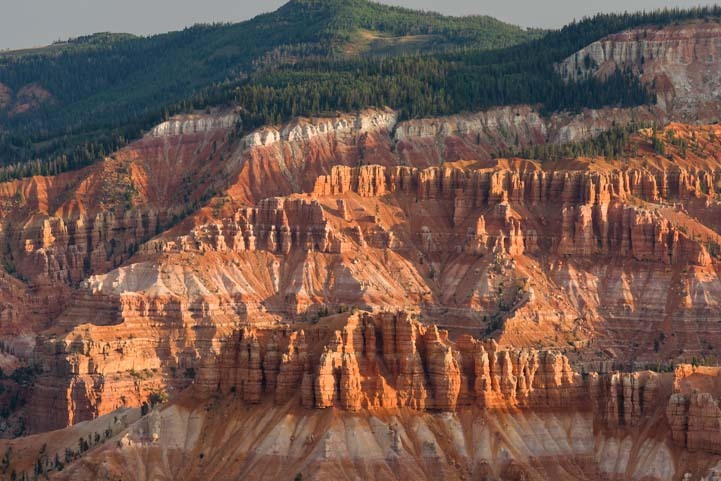 There are some links for planning an RV trip to Cedar Breaks National Monument below. Note: The road from Cedar City to Cedar Breaks (Rte 14) is steep and winding. If you have a strong engine in your motorhome or a strong truck to tow your trailer, it’s no problem. We towed our 14k lb. 36′ fifth wheel up the hill easily. Driving the road with your toad/tow vehicle first will help alleviate any concerns you might have (we did!). This entry was posted in Utah and tagged National Parks US, New, Red Rock Country, Travel, USA, Utah, Utah Southern, Utah Southwest, WP Travel by Roads Less Traveled. Bookmark the permalink. Lovely posting. We haven’t been to Cedar Breaks, snowed out each time we’ve tried. Your post makes us want to try again. Definitely try it again. And if it snows again but you can still get there, it might be really beautiful!!! 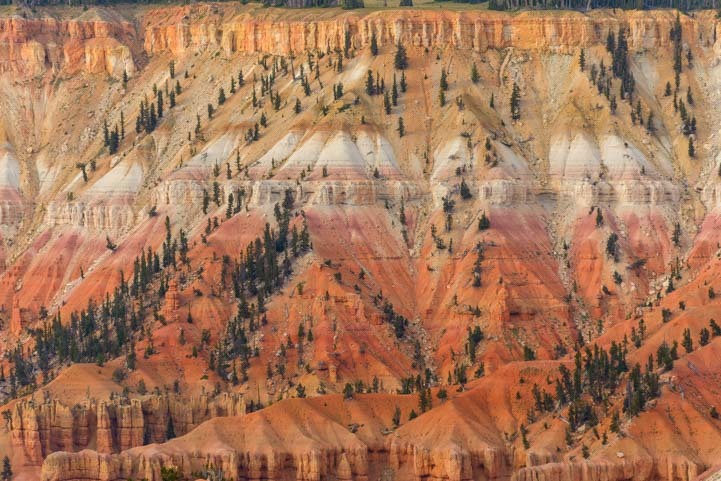 Thank you for posting this lovely description of Cedar Breaks. I have never been there, but I am studying to be an interior designer and when I stumbled upon your photos I thought what a beautiful pallet of colors to inspire a concept scheme I am thinking about – coppers, rose gold, pink, oranges. Just stunning! Thanks! Wow, Shanna, what a very cool note to see on this page! 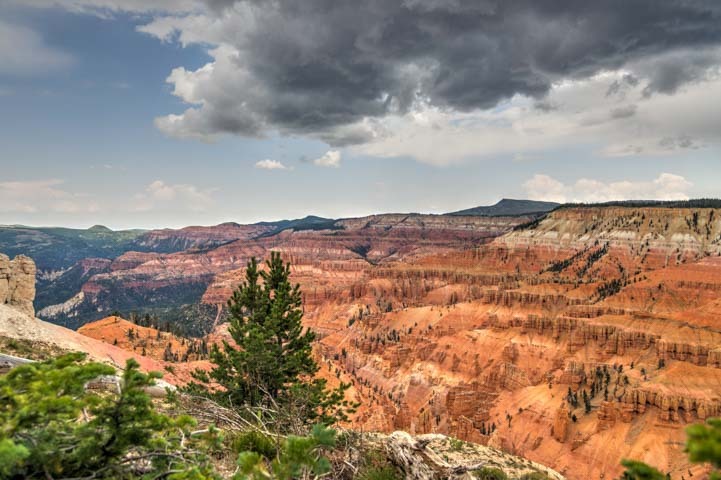 The colors of Cedar Breaks are mesmerizing, and they shift all day long, especially under brooding skies as patches of light and shadow passes across the canyon. I hope you are able to visit Cedar Breaks some day and see for yourself. In the meantime, good luck with your interior design concept and thank you for dropping a line! !